There are still places left in Jazz Camp 2014. Don’t miss out, don’t delay: get your registration in today. Jazz Camp 2014 is a five-day residential program for students ages 11 to 19. 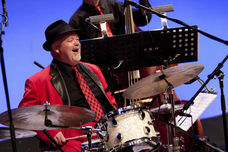 For over thirty years it has been Australa’s premier annual gathering of talented and motivated young jazz musicians. The program caters for instrumentalists (including string players) and singers at all levels of experience from beginner to advanced to emerging professionals. Alumni of Jazz Camp include a who’s who of top Australian jazz artists. Register today online and you can be part of this great tradition. JWA is a studio in St Leonards on Sydney's lower north shore for music lessons and bands. We specialize in jazz education, but teach classical and other lessons too. As a jazz school, we are unique in Australia. Everyone is welcome to JWA. Call us and we'll help you to learn jazz. Hi, I have a 11 year old boy who plays the saxophone in the school band but really like jazz. Do you have any camps or classes that would suit him. He is ABM leaves three.